Marching band member with tidy hair and clean uniform. Marching Band Fundamentals, one of the many educational films produced by the IU Audio-Visual Center which is now held by the Indiana University Libraries Film Archive (IULFA), explores this minutiae, yes, but more accurately serves as a live instruction guide for directors and “bandsmen.” For those of us who were never part of a marching band the details might be overwhelming. Notice the amount of military terms that occur before the six minute mark (“rank,” “file” “paces”, etc.). And, of course, the emphasis on shiny shoes and nice haircuts. These “bandsmen” are actually women! The observant viewer will notice many “bandsmen” whose haircuts may not be as tidy as the others; that’s because they’re women, referred to over and over again as “bandsmen” and “he.” This is not uncommon for educational films of this era, but the camera’s focus on these members of the band while the narrator uses gendered terms might be disconcerting for the 21st-Century viewer or, at the very least, cause some confusion when curls spill out of members’ caps. Perhaps an image that comes into the viewers mind as they watch the band go through their very specific motions is one of a stifling auditorium or gym filled with marching band members laboriously attempting to learn the commands from the film, as if they were dance instructions or a jazzercise video. Based on the very pedantic nature of the film it could have been used as such, so long as the projector was able to be stopped and the film rewound to repeat unclear commands. More than likely, however, it was for fledgling band directors in need of a refresher or for band director’s assistants who were in training. This assumption is made based on the work of the two men responsible for writing the film. Daniel L. Martino came to Indiana University in 1948 from Ohio University where he quickly established four concert units in the Department of Bands. Famously, he was the director of the Indiana University Marching Hundred which was deemed by John Philip Sousa in 1925 to be “the snappiest marching and playing band in the country.” During Mr. Martino’s tenure as the director of the Marching Hundred the band made three consecutive appearances at the Indianapolis 500, the Kentucky Derby, and, in 1953, was part of Dwight Eisenhower’s inaugural parade in Washington, D.C. In 1952 Martino released a book entitled Effective School Band Management which likely served as the textual counterpart to this film. Richard A. Worthington, Martino’s co-writer, was band director for Hobart City Schools, an Indiana town just South of Chicago, and was working on his doctorate at the time of the film’s creation. Later he took a position at Northern Illinois Teachers College. Their embrace of film for marching band education makes sense; diagrams, commands, and marching figures are much clearer on film, can be shown again and again, and were likely much more understandable to the newest members of any given band. An interesting feature of this otherwise very specific and somewhat pedantic film is the use of slow motion. High speed cameras would become indispensable to the field of biomechanics in the 1970s, but this simpler version — showing movement required of band members — was likely a remarkable achievement in marching band education. Again, combined with the ability to stop and rewind the film, those members in stifling gyms or auditoriums would, hopefully, learn their steps quicker, and get to the learning and practicing of music — which does not come until there is less than a minute left in the film — faster. The drum major looks on with grave intensity. While perhaps not the most engrossing film for the casual viewer, Marching Band Fundamentals Parts 1 and 2 is a glimpse into the promise of group education through film. Its combination of live-action, animation, and slow-motion would have been a novel and very helpful tool for band directors used to relying on rote learning and militaristic methods alone. Imagine the sigh of relief the director might feel when given the opportunity to let the film do the talking for them, allowing them time to let their strained vocal cords heal enough to scream a little bit more at the drum majors as soon as the film had run its course. Additionally, the film sheds some light on the intensity of an activity that is often so well-rehearsed, it’s made to look easy. If you were a marching band member you already know all of this. Those of us — myself included — who never experienced it, can now understand a little bit more why committed marching band members were so intense about it. Come on, that looks pretty hard! If you like this film there are plenty more Indiana University produced educational films streaming for your viewing pleasure. Check them out! In anticipation of the second annual Day of Digital Archives (DoDA) coming up on Friday October 12, 2012, we present a glimpse into the world of the digital film archive at Indiana University. DoDA was first established by Gretchen Gueguen as a way to connect archivists, digital humanists, programmers, and anybody else using or managing a digital archive. It is an online platform to raise awareness and spread knowledge about digital archives. To be more specific, who are the users of digital archives? Who manages them? What other projects are happening in the vast domain of digital collections? What can we learn about our own work by catching a glimpse of what other professionals in the field are doing? This being the second year of DoDA, the coming years will hopefully provide many connections and insights to other projects happening around the world. Past contributors have shared posts about data management, digital forensics, university archives, natural disasters and the video collections at the Hormel Gay and Lesbian Center of San Francisco Public Library, just to mention a few. Many of the contributors for DoDA 2011 deal primarily with born-digital objects, but for many institutions, and we at the Indiana University Libraries Film Archive are no exception, that is not requisite. Our online archive of digitized films were filmed between 1949-1978. These films were digitized over the course of the last 10 years by Scene Savers in Covington, KY. The Bradley Collection was the first collection to be digitized, however some of the items that are digitized cannot be streamed online due to copyright issues. The educational films that are online were all digitized in the past four years. Due to the fact that IU made these films and owns the copyright for them, we are able to stream them to the public. Issues of copyright are ever apparent with digital libraries given many materials people want access to are not yet in the public domain. Currently in the U.S., any work published before January 1, 1923 is considered to be in the public domain. We receive many requests on an almost daily basis for digitized copies of particular films in our collection. Oftentimes requests come from libraries, universities and researchers. After licensing and copyright issues have been cleared, we are able to send away for a digital copy, which is then loaned to the patron. In the future we will hopefully be able to digitize a large portion of our collection in-house and provide our own digital copies for specific requests. Currently, for titles already in our collection, item information may be retrieved from IUCAT. Because the majority of our holdings have yet to be digitized, metadata must be added to the catalog in order to locate an item. For collections that we have recently acquired, for example,the Oregon Collection, we are still processing, bar coding and adding metadata to each canister simultaneously as it is inserted into IUCAT. This is a time consuming but essential step in the process of digitizing these films down the road. Additionally, the Oregon Collection is still on the burner and we are continuing to plow through the remaining palettes at a steady clip. Palettes containing the Oregon Collection (most of these are now emptied and cleared away). In managing this archival collection, our goal is to preserve what we have through a process of collecting, organizing and ultimately making public our holdings. By allowing for easier access we ensure that these items are usable, not simply left to collect cyber dust in an electronic box with no key. When considering a digital library, it is important to note the difference between a website and a digital library or archive. According to How To Build a Digital Library by Ian Witten, a digital library is defined as “a focused collection of digital objects, including text, video, and audio, along with methods for access and retrieval, and for selection, organization, and maintenance of the collection.” Digital archivists must consider how they will collect, preserve and dispense or allow access to their materials. In contrast to a website, which might have little or no organizational structure, a digital library or archive must meet the needs of its users and allow them to find materials of their choosing. By including extensive metadata, users are able to browse and search tags or other components to find a specific item. Compared to the typical library where a user might simply browse the shelves until the right book jumps out at them, how do users find materials in digital collections? Are they able to browse and search? What tools must be put into place to allow for browsing and then, once an item is selected what is the protocol for accessing and viewing an item? There are many small things that must be taken into consideration when working with a digital collection and this is just a small slice of the pie. We will continue to provide quality materials and easily accessible finding aids as our online collection grows over the coming years. Have a great DoDA wherever you are! “This is like writing with light!” exclaims a young teacher in the 1956 instructional film Handmade Materials for Projection. What activity is she engaging in that was so exciting as to inspire her to reach for such an evocative metaphor? Well, if you chose scratching on a piece of carbon paper on an overhead projector for a lesson in how-to-write a business letter then you’d be right. That this rather mundane activity could prompt an educator to such poetic musings might be attributed to the often over-blown rhetoric found in educational films in the 1950s. However, I submit that moments such as these, which might seem corny to us now, are actually rather revealing insights into the ways that teachers and students thought about and experienced educational films. Or, to be more accurate, how the filmmakers imagined teachers and students experienced educational films. Examining these now out-of-date classroom films gives us an insight into how producers and educators predicted that the films would be viewed and utilized. As such, this affords us a chance to study earlier cultural assumptions about the pedagogical role of media, which, ideally opens up a discussion of the forces guiding our current digital mediation and technologization of education. The film represents itself being screened in the classroom. This quote gets at why teachers used, and continue to use, mass media in the classroom, an impulse that is essential to the creation of the films that are at the core of the Indiana University Libraries Film Archive. First, media, even something as unremarkable as an overhead projection, brings the lesson to life. Second, it’s not a frivolous animation but one that’s intimately yoked to the educational goal of the class. Third, and this is no small shakes here, the use of media in the classroom allows a teacher to keep the students focused on what she is saying. Classroom media was used to make a lecture exciting, had to have a clear pedagogical mission, and was deployed to regulate student behavior. (No students are actually seen in this film; the film presents no proof that these techniques actually interest schoolchildren which points to one of the great unknowns in educational film: what did the students sitting in the classroom actually think of these mediated instructions). As this film and others like it such as Photographic Slides for Instruction (1956) and How to Make Homemade Lantern Slides (1947), both of which are embedded at the end of this post, suggest educational films were not just made for students, but also for teachers to instruct them in how to incorporate the then new media into their classroom. Further, educational films were part of a much larger infrastructure in media available for the classroom including filmstrips, records, slides, and overhead projectors – and eventually cassette tapes, videotape, and now Power Point. This is an important point to realize when watching old educational films. They rarely stood alone and were often part of a larger educational effort that might have included textbooks, suggested lesson plans, slides, etc. So while we will be mainly posting videos digitized from old educational films, please keep in mind that there was a larger media ecosystem in the classroom that these films are only one example of. The film shows techniques for depicting 3-D objects with two-dimensional media. In fact, the educational author of this film, Harvey R. Frye, published a very similar article in the August 1957 issue of the Journal of the Society of Motion Picture and Television Engineers called “Slide-Projection Materials on Minimum Budgets.” In comparing the article and the film, the advantages in each medium for teaching becomes quickly apparent: each has more or less the same information, but the journal article allowed a teacher to easily go back over the techniques of making slides while the film includes dramatized examples of teachers in awe at the process. In fact, what each medium allowed a teacher to do was at the core of Frye’s efforts in training educators to use media for pedagogical purposes. As he and his co-author Ed Minor assert in the introduction to their 1970 book, Techniques for Producing Visual Instructional Media, having a sense of the specificity of each medium was the key to knowing how to utilize mass media in the classroom. They state unequivocally that, “materials should be prepared only when they will do the job of communicating better and quicker than any other method of communication available”. In the off chance that anyone reading this posting knew Harvey Frye or other filmmakers at the IU Audio-Visual Center please contact us. We are in the process of researching the production and exhibition of these films and any help would be much appreciated. As has already been mentioned on this blog, the Indiana University Libraries Film Archive (IULFA) recently posted close to 200 films from its collection for streaming. This effort is an important part of the Archive’s, as well as the IU Libraries’, central mission of providing access to students, faculty, researchers, and the larger public to our collection of over 80,000 films. This monthly series of blog postings, which we’re calling “Presenting…”, will examine one of these streaming films in greater detail, look at its production and exhibition history, and connect them to the wider field of film scholarship, moving image archiving, and media pedagogy. This first batch of films we’ve put online were made by the University’s Audio-Visual Center, or AVC for short. The AVC was founded in 1912 (Happy 100th Birthday!) and it functioned until the beginning of our current millennium. During its existence the AVC worked to create and distribute educational materials in the new media formats of the day, be they magic lantern slides and photographs, motion picture film, videotape, or computer programs. Most relevant to our work as a film archive the AVC distributed over 35,000 titles from a variety of educational film producers, as well as making its own line of award-winning films that benefited greatly from the expertise of IU’s professors. In later postings we will look more closely at some of these classroom films that explored the functioning of biological lifeforms, the structural inequalities that held back lower income Americans, the ways to teach with electronic and photographic media, and other topics in the hard and soft sciences. 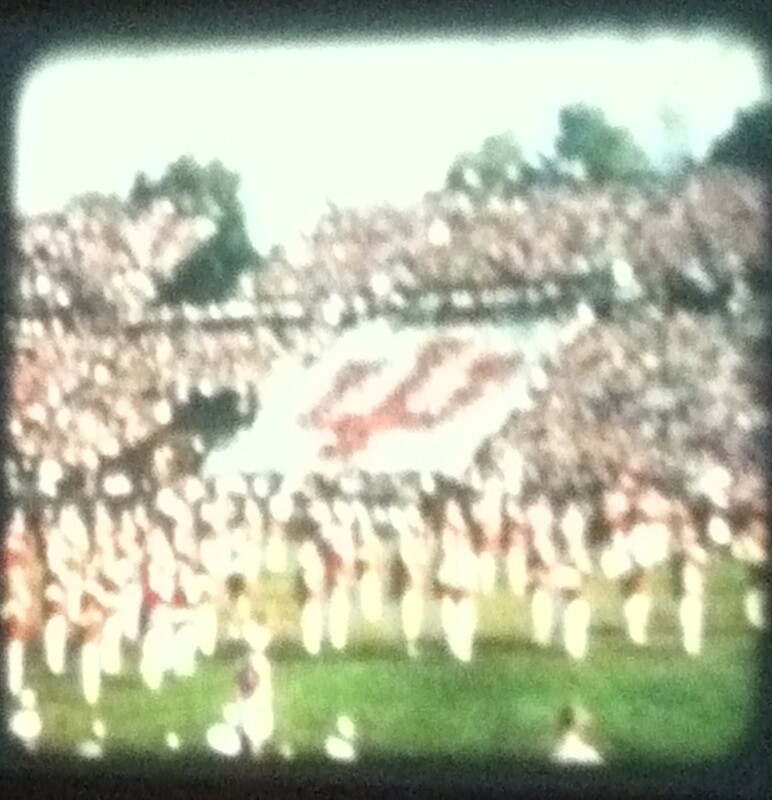 The AVC also made a number of films about Indiana University. It seems appropriate to start this blog series presenting the film work of Indiana University with a 1961 film, Presenting Indiana University, that presented the college to potential students. They would have seen a student body integrated by gender and race, though the faculty was still, as seen in this film at least, entirely white men. Potential IU attendees would have also gained a sense of the social atmosphere of the campus by watching the film. They would have seen a student body integrated by gender and race, though the faculty was still, as seen in this film at least, entirely white men. High school students would have gained a sense of the respectful classroom environment at IU, where professors mixed lectures with probing questions to their class that seem designed to elicit engaging discussions. Though these in-class sections might seem a little staged now, the scenes show students grappling with heady intellectual material, such as the sequence in Dr. Henry Beech’s philosophy seminar where he and a young woman debate the freedom of choice available to a narcotized society, which can be viewed at the ten-minute mark. Just as importantly, viewers would have learned that a University is much more than only the classroom. They would have seen the breadth of departments and facilities that supported their educational career at IU including the libraries (the film shows the new reading rooms and the priceless artifacts of the Lilly Library), the advising system offered by the Junior Division, the state-of-the-art computer center, and, of special interest to our archival work, the IU film library and audio-visual support center. IU film library and audio-visual support center. Further, by watching the film high schoolers would have seen all of the ways they could have gained practical experience while at IU including a number of student theater groups, teacher training programs, and the student newspaper. They would have received a sense of the world-class entertainment offered at IU including lectures by Nobel prizewinners, operas by the Music School, football games, art openings, and proms. However, since this film no longer fulfills its intended purpose, what is the value of watching it today? Well, there are the always entertaining differences between then and now that one finds in old films, such as buildings that are no longer standing and changes in clothing worn by students – college men used to wear ties like nobody’s business! More importantly however, this film provides revealing insights into how a university justified its existence fifty years ago. It’s no secret that higher education is currently facing a myriad of challenges from declining state funding, rising tuitions, and the disruptive yet beneficial shockwaves of the digital transformation. Presenting Indiana University doesn’t directly address these concerns or provide us with any easy answers in 2012. But it does provide us with a clear sense of the central purpose of a university, which is to, as the film’s narrator states, “help each student probe the limitless frontiers of his own mind” in the goal of transforming them into “a contributing citizen in our modern society.” As the gendered use of the word “he” implies, we have to continuously update these goals for our current times, exegencies, and community. But as the film makes explicit throughout, the unfettered but directed pursuit of knowledge, however ridiculous it might appear – check out the sequence where they are bombarding a woman with painful sounds again – has a clear benefit to students as individuals and the society they enter when they graduate. Like all universities, IU has continued to make these sort of promotional films. If you’re interested, you can check some recent examples of this genre of film/video making out at the IU YouTube page. These current videos cover many of the same topics as Presenting Indiana University, but, not surprising considering the shorter duration of YouTube videos, are broken up into more discrete chunks. Comparing these newer videos such as IU Extraordinary, Welcome Home, and This is Your Epic Adventure (all below) to Presenting Indiana University shows the continuity and changes in how a university promotes itself. While many of the same issues are covered, the student’s individual experience, on an academic and emotional level, takes center stage in a way not found in the 1961 film. Part of this difference can be explained by changes in the technology and styles of filmmaking; video records live sound in a way that was more complicated to achieve in 1961 and we expect people to speak for themselves instead of only hearing from a voice-of-god narrator. However, the change suggests a greater emphasis on the student’s mental and physical wellbeing than just the intellectual aspects focused on in Presenting Indiana University. To conclude, looking at these old promotional films, especially in relation to current publicity campaigns, affords an understanding of what a university thinks is most important at that particular time. This can reveal whom they were trying to appeal to and which social, political, and economic forces they were responding to.